While lopsided majorities of Hispanics and Asian Americans support creating a pathway to citizenship for unauthorized immigrants, two new national surveys from the Pew Research Center also show that these groups believe it is more important for unauthorized immigrants to get relief from the threat of deportation. By 55% to 35%, Hispanics say that they think being able to live and work in the United States legally without the threat of deportation is more important for unauthorized immigrants than a pathway to citizenship. Asian Americans hold a similar view, albeit by a smaller margin (49% to 44%). Yet, large majorities of Hispanics (89%) and Asian Americans (72%) support a U.S. Senate provision providing a 13-year pathway to citizenship for unauthorized immigrants. If the current immigration bill fails, a plurality of Hispanics (43%) and Asian Americans (48%) say they would mostly blame Republicans in Congress. But sizable minorities of each group (34% of Hispanics and 29% of Asian Americans) say they would hold Democrats in Congress and/or President Obama mainly responsible. Hispanics and Asian Americans are two groups with big stakes in the immigration legislation now stalled in Congress. Together they account for two-thirds of the 28 million immigrants who are in the U.S. legally, and Hispanics alone account for about three-quarters of the additional 11.7 million immigrants in the country illegally. Large majorities of both groups say they have heard or seen at least a little about the legislation, but 67% of Hispanics and 72% of Asian Americans also say they don't know enough about the details of the bill to say if they support it or not. Still, immigration reform is important to both groups. Seven-in-ten Hispanics (69%) say it is "extremely" or "very" important to them that new immigration legislation pass this year, as do 44% of Asian Americans. This 25-point gap in urgency is likely related to the fact that many more Hispanics than Asian Americans are in the U.S. illegally. Since 2009, the Obama administration has been deporting a record number of unauthorized immigrants (nearly 400,000 per year), the vast majority of them Hispanic. About six-in-ten (59%) Hispanic immigrants and 46% of all Hispanics say they worry "a lot" or "some" that they themselves, a family member or a close friend could be deported. By contrast, just 18% of Asian-American immigrants and 16% of all Asian Americans say the same. Immigrant Hispanics are especially supportive of deportation relief; by 61% to 27%, they say it is more important to unauthorized immigrants than having a pathway to citizenship. Among native-born Hispanics, the shares are 48% and 44%, respectively. Large shares of both groups see upsides and downsides to granting legal status to unauthorized immigrants. Majorities of Hispanics (76%) and Asian Americans (59%) say that granting legal status to unauthorized immigrants would strengthen the U.S. economy. Yet, 53% of Hispanics and 48% of Asian Americans say granting legal status to unauthorized immigrants would reward illegal behavior. Many more Asian Americans than Hispanics say they or their family members have had some personal experience with the U.S. immigration system ---- 69% vs. 45%. This is not surprising given the greater share of Asian-American adults who are immigrants. Hispanics are more likely than Asian Americans to say the U.S. immigration system needs to be "completely rebuilt" or needs "major changes" ---- 62% of Hispanics say that compared with 47% of Asian Americans. Nonetheless, when asked about specific aspects of the U.S. immigration system, evaluations are generally positive for Hispanics as well as Asian Americans. Among Hispanics, 32% say the issue of immigration is an "extremely important" one facing the nation today. Among Asian Americans, just 17% say the same. 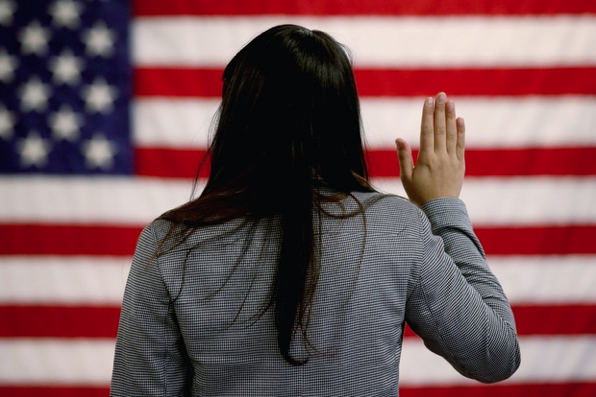 For both Hispanics and Asian Americans, the surveys find that among five domestic issues tested (jobs and the economy, education, health care, the federal budget deficit and immigration) immigration ranked last. The report, authored by Mark Hugo Lopez, Paul Taylor, Cary Funk and Ana Gonzalez-Barrera, is available at http://www.pewhispanic.org/2013/12/19/on-immigration-policy-deportation-relief-seen-as-more-important-than-citizenship/. Pew Research Center is a nonpartisan source of data and analysis. It does not take advocacy positions. Its Hispanic Trends Project, founded in 2001, seeks to improve understanding of the U.S. Hispanic population and to chronicle Latinos' growing impact on the nation.